Aaron poses in his daddy’s viking helmet. 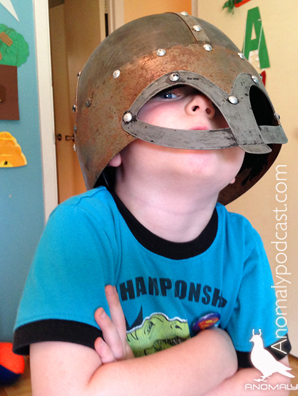 This is a movie review and a slice of life hybrid; the first edition of a new podcast series and one of many adventures to be shared by this geek mom and her rambunctious preschooler. I’m Jen. Minutes ago, I stopped myself from correcting a Twitter user when he mistakenly used the hashtag #StarTrek in a tweet about lightsabers…and I am an Anomaly. Two weeks ago, my husband Dave and I took our little geekling, Aaron, to see How to Train Your Dragon 2 in 3D. We all enjoyed the first film and the sequel certainly did not fail to entertain us. Aaron, who will be four years old on July 25th, was on the edge of his seat throughout most the film. His favorite parts were any and all of the flying scenes—duh, awesome! He is particularly fond of the cute, silly dragons who hop around like kittens one minute then fearlessly defend their masters the next. In fact, as he sat perched on the seat between me and my husband, he gave a very boyish, “YEAH!” every time a heroic dragon took on the bad guys and won. His cheering resulted in several grins (AKA “facial high-fives”) between his parents. I think Dave and I enjoyed How To Train Your Dragon 2, or as I refer to it: “How to Train Your Geekling (to Love Fantasy) 2”, just as much, if not more, than our little one. It’s an action-packed trip full of twists and turns! It’s funny! It’s beautiful! The acting is fantastic—Cate Blanchette is amazing as usual—and the script is well written. 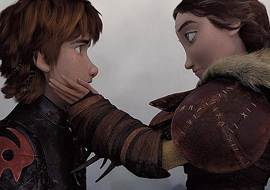 As a side note, I love the new character Valka and after the movie, I found myself thinking of how AWESOME it would be to cosplay her at Austin Comic Con. It was only when the heavy dialogue began that Aaron’s preschool-level attention span kicked in, and his focus wandered aimlessly away from the Island of Berk. During the scenes that did not include brave little dragon things, he was being…well…a soon-to-be four-year-old. At one point he turned in his seat, pointed at the projector and asked in his outside voice, “Can we go up there? !” That was just the start of the “fun”. His theater seat kept folding up on him, causing his Ironman shoes to block his view of the screen. And when that wasn’t happening, he was kicking the seat in front of him while periodically inquiring, again in his outside voice, “Can we go home! ?” He is a certified wiggle worm who did his best to stay still for almost two hours, so I refrained from removing him from the theater that was, after all, showing an animated film. I know it doesn’t sound like it, but he really did love the movie. But I’ll let him tell you in his own words, later on. There are several great messages in this film; morals that I, as a parent, approve of: always be yourself, be a loyal friend, girls are heroes too, use your gifts and talents for good, don’t let bullies control your happiness, try your best to solve conflicts peacefully, use force only when necessary, and brains are more powerful than brawn. But the most important lesson is that forgiveness heals wounds, so don’t waste your time holding grudges. It’s not easy, but when you forgive others of even the most indefensible deeds, a weight is lifted and you can begin to move towards happiness. Aaron can’t grasp the deeper messages on his own, so I talked to him about the movie, and expanded upon some of the themes, using examples from his own experiences. There is much that can be learned from this kids’ movie about flying dragons, and I’m a firm believer that we should never miss an opportunity to teach our children about the principals we believe in. However, there was one scene in How To Train Your Dragon 2 that I am glad my little one did not watch; It’s the one time I can say I’ve ever been grateful he has a bladder the size of an almond. During the scene in question, his daddy took him to the bathroom for the second time since the start of the movie. I don’t want to spoil the story, so lets just say that what transpired was awful, tragic, and extremely sad, and I noticed several other young children in the theater becoming upset. The cynical part of me thinks that Dreamworks pulled a page from Disney’s classic movie playbook (crying kiddos = profit? ), but the other half knows the sad scene was a device inserted in the story for the express purpose of plot and character development. It was difficult to watch, yes even for me, but its inclusion was necessary in order to make a “good” story a “great” story. But…ouch Dreamworks…ouch. Is this movie appropriate for kids under six or seven? It’s best for parents to decide what’s best for their own children, on their own. I want to believe my four-year-old could have handled it, but he definitely would have used his outside voice to ask, “WHY DID HE DO THAT, MOMMY?” And then I’d have to explain the how and why of it, which is not something I wanted to do when I decided to take him to an animated movie about flying, brave, kitten-like dragons. Again, it was a very good movie with lots of great lessons to teach children. But be warned: there’s a heartbreaking scene or two and you’ll have to decide whether or not it’s appropriate for your own geekling. If you need more information to make that decision, I’d be happy to help. Send us an email and I’ll give you the details. And now, I turn the review over to my little boy who has been itching to tell you all about what HE thought of the movie. Here’s the audio version of this blog post. At the end, “Aaron the Red” will chat with me about the movie for a short time, before changing the subject and talking about Disney’s Planes: Fire and Rescue , his LeapFrog LearningPad and Jake and the Neverland Pirates. 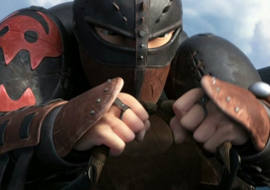 Linda and I listened to your review of “How to Train your Dragon 2” with Aaron’s comments. We really enjoyed it and look forward to more “interviews” with Aaron. Hi! I’m glad you liked it! Hope to do these regularly with Aaron. He really loves it and so do I.